Stripe recently released its report The Developer Coefficient asking both C-level executives and developers to identify the largest constraints to innovation. The takeaway: executives worry more about finding skilled developers than they do capital, with 53% identifying access to software talent as a major constraint and 52% identifying capital. 96%: the number of C-level executives that believe increasing developer productivity is high or medium priority. 68.4%: how productive on average developers believe they are as a whole, 100% being perfectly productive. Many companies have incorrectly attributed their technology woes to a lack of developer talent. How so? 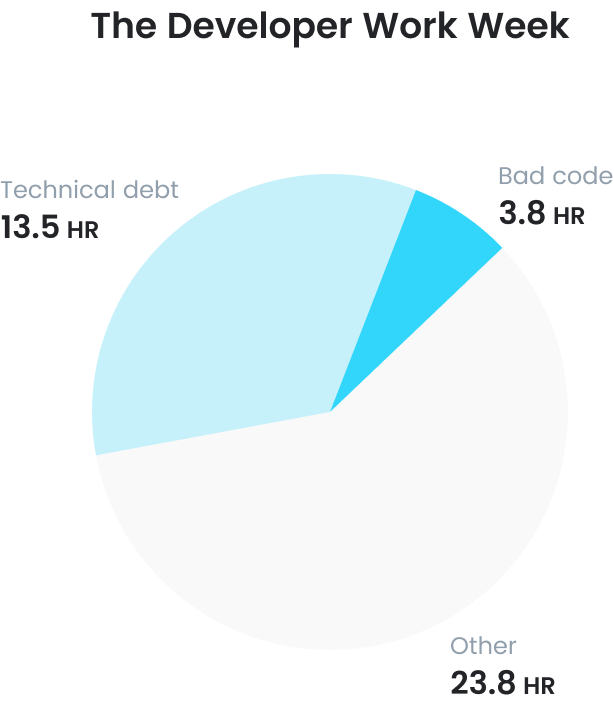 The average developer spends 17.3 hours each week dealing with technical debt, bad code, and maintenance jobs, like debugging and refactoring. That’s a 31.6% efficiency impact that equates to an estimated nearly $300B loss in global annual GDP, which is equivalent to the entire GDP of Pakistan. ‍Looking to the future with confidence? Despite the efficiency impact, roughly 83% of C-level executives and 77% of developers are very or somewhat confident they have sufficient resources to keep up with new technology trends, like AI/ML, IoT, and blockchain. And yet a whopping 44% of developers believe their company is too slow to react to tech trends. Something doesn’t quite add up. Instead of coveting developers over cash, maybe companies need to innovate and react faster to new technology trends.